See, here in my tiny mountain town it is remarkably dry. Seriously dry. Like, my weather station thingy sitting on my counter is telling me that it is 4% humidity in my house right now. I can feel my little membranes shriveling as we speak. So I am on a constant hunt for something to save my poor skin. And I have tried everything, let me tell you. And my most recent addiction is homemade sugar scrub. Two reasons - first, it couldn't be easier to make, and I love easy. Second, it really helps to keep the moisture in my skin versus out of it. Oh, and there is the fact that it feels absolutely luxurious to use this. That helps too. To make a sugar scrub, you need just a couple simple things: sugar, oil, and essential oils. Actually that last part isn't something that you technically need, but it makes it that much more fun. Or therapeutic. Or rejuvenating. Or whatever it is you are looking for. 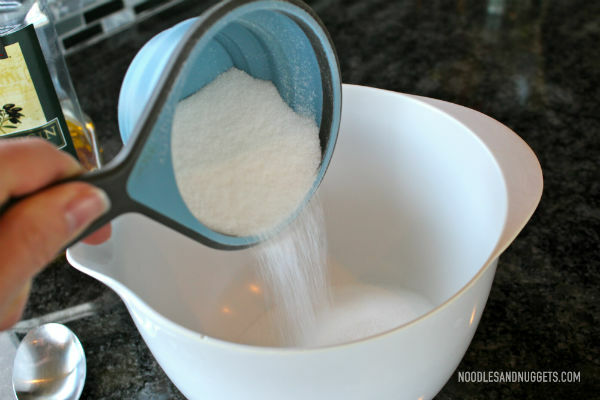 Measure out about a cup of sugar into a bowl. Maybe more or less depending on the size of container you plan to put your scrub in, but roughly a cup will last you for a good bit. Unless you're like me and slathering this stuff on not just daily but maybe even multiple times a day. Then the chances are good you will be making this often. So pay attention. In the beginning I used sweet almond oil in my mix. Not for any particular reason, just because that was what I was told so that was what I used. But when that first one ran out, all I had on hand was olive oil. Thick, yes. Olive oil smelly, yes. But I went for it anyway, and I am so glad I did, because my skin LOVED it. It feels like velvet, and shaving after using this on my legs is bliss, if shaving can ever qualify as bliss. And with the essential oil in the mix, you don't smell the olive oil at all. So yummy! In the summer, when perhaps it won't be quite so very dry, I might switch back to a lighter oil, but for now, I am loving the olive oil. And feeling a little like a salad, but whatever. Add about a 1/4 cup of oil to the sugar and start mixing. It will start to look like wet sand. We'll move on to my secret weapon next, so if it feels like you should add a bit more oil to it, resist temptation. We're going to get there. I made this scrub so many times, and just felt like something was missing. It was good, but I always felt like it could be better. I don't know why it took me so long to figure out that I NEEDED to add coconut oil, but once I did this scrub was perfection. For me. It was perfection for me. And, admittedly, I am easily appeased. But seriously, coconut oil just put this mix over the top. Just shploop a big heaping tablespoon, the kind you might stir your coffee with, not a real tablespoon, into a microwave safe bowl. Then ignore the little bit that bailed over the wall onto your counter, or better yet, just scoop it right back in there. Show it who's boss. Microwave the coconut oil for maybe 15 seconds, then check it. Give it a little stir. Keep going like that until it is completely liquid, then just dump it right on in the sugar mix, and start mixing it in. It will look goopier. Oilier. Perfecter. And yes, I absolutely know that perfecter is not a word. But today it is for me. Next add several drops each of your essential oils. I seem to always use some mix of citrus oils (wild orange, grapefruit and Citrus Bliss is my mix of choice) but there are any number of scents you may go for. Vanilla peppermint? Ginger Lime? Lemon Lavender? Your choice. Mix it up. And remember, you might not smell it very strongly when you mix it, but when you are in the shower, the scent of the essential oil seems to come out stronger. Maybe from the steam? Not sure, but I do know that you will love it! Maybe just one more. I love essential oils. Also, probably ignore my hands. They are gross. My apologies. Okay, it's boring but it does the job perfectly. But that isn't really what's important. What's important is all that oily goodness that is going to save my skin. And maybe yours, too. In the shower (not that you need to know my routine in the shower, but I'm all for being helpful), I wash my hair and body, and then I use the scrub before I shave my legs. That way I don't need to use any kind of funky shaving gel in all it's chemical glory. The oil in the scrub is all I need. AND, as if that wasn't enough, the oil residue (yes, I know that sounds gross, but it is what it is) goes a long way toward moisturizing my poor dried out skin. On top of it I add a thick layer of my lotion concoction that I have started using, but that is another post for another day. So grab yourself some sugar, oil and smelly stuff. You'll be happy you did! What are your favorite scrub scents? This sugar scrub looks fantastic! I really need something like that for my hands and elbows. I love it! I can't wait to try this recipe. Thank you so much for sharing. Can't wait to try this. Thanks for sharing. I cannot wait to try this...I love homemade body scrubs...and I need to shed too!